I was up to the Cottage this weekend to check in on my drywall contractor. He had been delayed because of a snowstorm last week so I needed to gauge where he was at. He was in the middle of priming the drywall, as the taping and plastering was all complete. If you look closely in the window you can see his son paining with a roller in the master bedroom. I was impressed, Darrel, my drywall contractor, had almost his entire family involved in the priming: wife and two sons. While they were no way complete it was clear they had done this before - I was assured of a professional job. 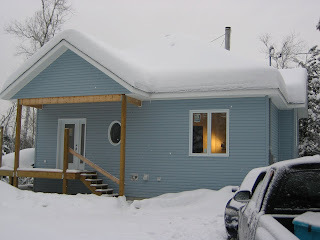 As you can see there is literally piles of snow up at the cottage - there is almost three feet of snow on the roof.